We’ve recently done an article on the best baby bath tubs and mentioned that your child should be ready for his first bath by the time his umbilical cord has fallen off, which is usually between his 10th and 14th day. In this post, we’ll talk about one of the most important aspects of a baby bath, and that is the baby shampoo. We know you can’t wait to find out what the best baby shampoo is, so let’s begin. We can easily pick five of the most popular baby shampoo products available today and tell you that they are safe for baby use, but that’s not how we do things here. We want to make sure we only give you options that are truly safe for your child. For that reason, there’s a chance that many of you may not be familiar with the names we’re recommending below. Nevertheless, you can rest assured that we did our research about these products and we are sure that they are the safest for your little one to use. These are the real good stuff, most of which contain ingredients that are genuinely organic. You will also observe almost all of these are not “no-tear” baby shampoo, but that’s because they do not contain chemicals (such as the formaldehyde-releasing substance, 1,4-Dioxane, that has been linked to cancer) that produce the “no cry” effect. Without further ado, here are your five best baby shampoos. 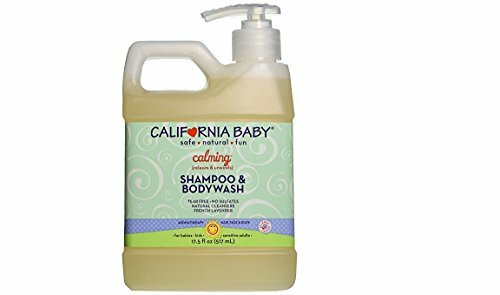 For those of you looking for safe, “Tear-free” shampoo for your little one, the California Baby Calming Shampoo & Wash may be the choice for you. Despite being tear-free, this product does not contain 1,4-dioxane. 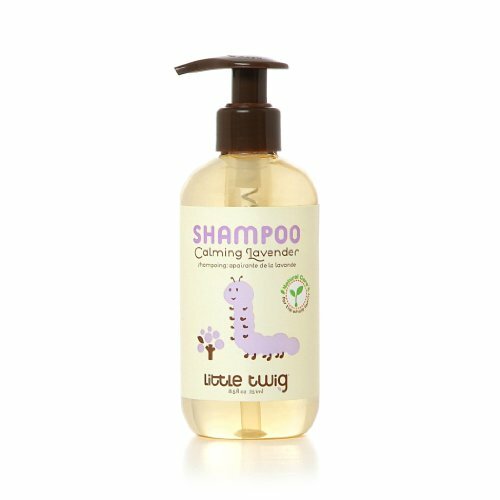 It provides a light and fresh calming blend that leaves your child’s hair soft and manageable. It also contains high-quality essential oil and has been found to be effective against eczema and a number of skin sensitivities. Perhaps what you will like about this product is that it doesn’t contain synthetic fragrances and is free of phthalate. It’s concentrated, which means a small amount can produce good lather. The bottle is user-friendly and allows one-hand pumping. The shampoo’s calming effect makes your baby go right to sleep after his nighttime bath. It contains sodium benzoate, which may make some parents uncomfortable. This body wash and shampoo from Earth Mama may be one of the “most organic” (if there’s such a thing) baby shampoos available today. It’s made from natural castile soap and does not contain fragrance, artificial preservatives, SLS, phenoxyethanol, parabens, or phthalates. It smells naturally with sweet orange essential oil and organic vanilla and also contains calendula. It’s a foaming bottle, which means a little can go a long way. Each pump releases just the perfect amount. Some parents may not like the no-tear formula. 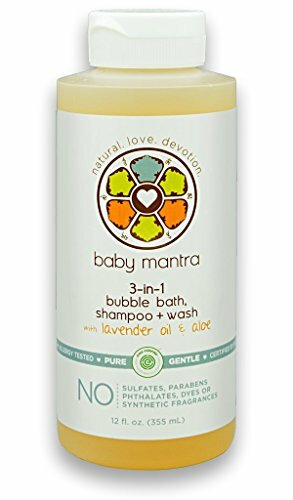 Parents who are overly conscious as to what goes into their baby’s shampoo may love this one from Baby Mantra. It’s allergy tested and is certified by PETA and NPA. It’s top-rated by EWG, as well, and is approved by Healthy Child Healthy World. It contains no gluten, no toxins, and no artificial preservatives and only offers natural and organic ingredients. This is a shampoo, bubble bath, and body wash in one and provides a moisturizing, soothing, and calming effect. It rinses clean easily despite being a bubble bath. It lathers well but is not too gooey. It lasts long for such a small bottle. It’s not 100% natural, although it doesn’t really claim that it is. Seldom will you find an organic baby shampoo that’s also tear-free, and that’s just what the Little Twig All Natural Shampoo is. It’s made with organic ingredients and contains no propylene glycol, dioxanes, parabens, PEG’s, sulfates, and phthalates. It’s also Ph-balanced, which means it can clean the hair and scalp without irritating the skin and eyes. With its lavender oil content, it produces a soothing and calming effect during and after bath. Other contents of the shampoo include tangerine, lemon leaf oil, tea tree oil, and chamomile flower extract. It lathers well and rinses very fast. It’s effective for detangling long hair. The lavender aroma is not overpowering. Since it doesn’t contain all those chemical emollients, it has to be applied to one section of the scalp at a time. Babo Botanicals is known to produce a line of safe, great-smelling shampoos. This particular shampoo and body wash is rated number one in safety on Environmental Working Group (EWG) and contains plant-based cleansers that nourish and soothe the skin. It also contains oat milk that helps deal with eczema or chafed skin. Most importantly, it has calendula oil, which is best for dry patches on the scalp. Other ingredients present in this certified organic baby shampoo are watercress, kudzu, and chamomile. A small amount is enough to create good lather, and it rinses easily. It doesn’t dry out the skin or cause irritation. The design makes it easy to open and shut; it also doesn’t slip easily on wet and soapy hands. The calendula smell may be too strong for some. I was personally torn between Babo Botanicals and Little Twig. I loved the fact that Little Twig Natural Shampoo contains mostly organic ingredients and has a smell that’s not too overpowering. 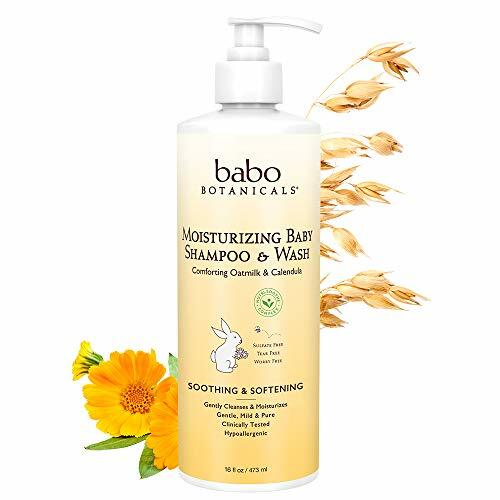 However, our vote for this selection goes to the Babo Botanicals Moisturizing Baby Shampoo and Wash mainly because it’s a shampoo and body wash in one. It also contains oat milk, which is excellent for treating and preventing eczema. In addition, it’s specially made for sensitive skin and won’t leave your child’s skin dry after bathing. Concerning the bottle’s design, it’s slimmer and is easier to handle compared to the other four products in this selection. Most importantly, it’s reasonably priced for its quality and will last quite a longer time than its counterparts. We’ve mentioned that the calendula smell can be too strong, but the smell gradually disappears once your baby’s hair has dried. However, if the smell of calendula doesn’t really bother you, it wouldn’t be too much of a problem at all. Overall, this is a great, affordable shampoo that’s gentle and safe on your baby’s skin, and one you won’t regret using. Should Your Newborn Use Baby Shampoo? Manufacturers do not sell their products without first conducting extensive safety tests and making sure all ingredients they add are approved for use in infant formulations. In addition, baby shampoo is different from regular shampoo. The latter uses sodium lauryl sulfate or SLS, which is a very good detergent and provides lather at the same time. Most baby shampoos do not contain them, though, because they can irritate the eyes. Instead, baby shampoo uses amphoteric surfactants, which are milder. They can clean without causing irritation, thus, the term “tear-free,” but they do not foam well and are not as efficient at removing oil buildup. Of course, this is not a big deal since we’re talking about newborns who normally have cleaner skin. Nevertheless, while baby shampoo is generally safe, a certain study done several years ago raised concerns about the presence of harmful chemicals in such products, especially those that boast “tear-free” on their labels. The study didn’t find any evidence of actual harm on babies, but it still triggered some anxiety both in parents and environmental groups. So, to answer the question if you should use shampoo when bathing your baby, it’s really up to you. The use of any baby product is a matter of individual choice. But then again, you wouldn’t want to use anything that would cause harm to your little one, which leads us to the next part of this article. The primary thing to check when buying shampoo for your child is the label saying that it’s mild and is made specifically for babies. Most products designed for children under three years old go through safety assessment, although we can’t be too sure whether or not clinical research has been conducted on the effect of a particular product on infants’ skin. The best way to protect yourself and your child is knowing how to read product labels. Only look for a baby shampoo that’s been specially formulated for babies. Since an infant’s skin is thinner and is more delicate than your skin, they should be given mild cleansers designed to protect the natural balance of their skin while maintaining the protective layer. Never use products on your baby’s skin that contain alcohol, soap, and perfume, as they can cause irritation or allergic reaction. There is no perfect skincare product out there for your baby. Regardless of how “natural” the ingredient of his shampoo is, if he’s allergic to it, he’ll experience some irritation. However, it’s still imperative that you find one that contains fewer toxic chemicals as possible. Also, the fewer the ingredients, the lesser the risk your child will be exposed to. What about you? What shampoo and body wash do you use for your little one? Let us know through the comments section. And oh, before I forget, click on one of the share buttons below to spread the word. Thank you!